You don’t often associate Eureka Entertainment’s Masters of Cinema label with anime, although they do occasionally release some choice classic and independent Japanese cinema. But last week they announced that they would be releasing Metropolis on Blu-ray. It previously saw a DVD release in the UK from Sony. Given the love that Eureka has shown to Fritz Lang’s Metropolis, it’s quite fitting that they should release Rintaro’s adaptation of Osamu Tezuka’s Metropolis as well. The irony is that that apparently Tezuka never saw Fritz Lang’s Metropolis. All he saw was the poster to the film, and that was enough to inspire his manga. Just one review last week and that was Nana: Complete Collection. It was also another show that I had to import, as its female oriented character drama is a genre that rarely gets picked up in the UK. Two women with the same name, but wildly different personalities both move to Tokyo for different reasons, yet wind up becoming best friends and living together. Nana Komatsu is looking for love, while Nana Osaki wants to be a rock star. Its more realistic take on relationships differs from the usual anime that gets released in the UK. You might call it more of a soap opera, but Nana has the production values and the quality of writing to elevate it above such melodrama. It also has some great music. Eden of the East. This was such a big deal when it was first released, Kenji Kamiyama’s follow up to Ghost in the Shell: Stand Alone Complex. He revisited the cyberpunk genre once more, but this time with a more contemporary setting, looking at modern social networks and communications. This was cyberpunk for the smartphone generation, coupled with an ingenious ‘death’ game, where twelve players are gifted with a unique phone, charged with 10 billion yen, and asked to do whatever possible with that money to improve the country, although what that might be differed according to their specific personalities. While one player might build a hospital, another would think nothing of launching a terrorist attack. The show starts in a provocative way, with its protagonist, naked but for a phone and a gun, outside the White House, suffering from amnesia. Fortunately he gets some help from a passing Japanese tourist, who also helps him discover who he is, a player in this strange game. 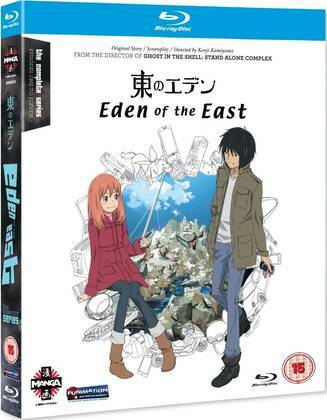 Manga Entertainment released Eden of the East on DVD and on Blu-ray, as well as the two feature film spin-offs, and they are still available on retail (although Manga’s license has lapsed). I’ve reviewed the show here, and while I still find it to be as entertaining and exciting as it was when I first saw it, after all this time, something about the characterisations seems to ring false now, as if the characters are too frivolous and easy-going for the situations they find themselves in. I’d still recommend Eden of the East though, as it’s still a damn sight better than 99% of the anime that gets released in the UK. Later this year, All the Anime will give Eden of the East a re-release in a bells and whistles Collector’s Edition. 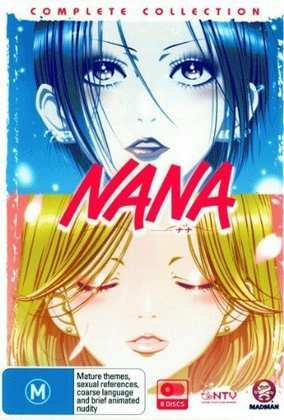 Madman Entertainment released the Nana: Complete Collection back in 2012, and at this time it’s deleted. You’ll have to look around for any lingering copies, and will probably have better luck second hand. The same is true for the Region 1 US release from Viz.